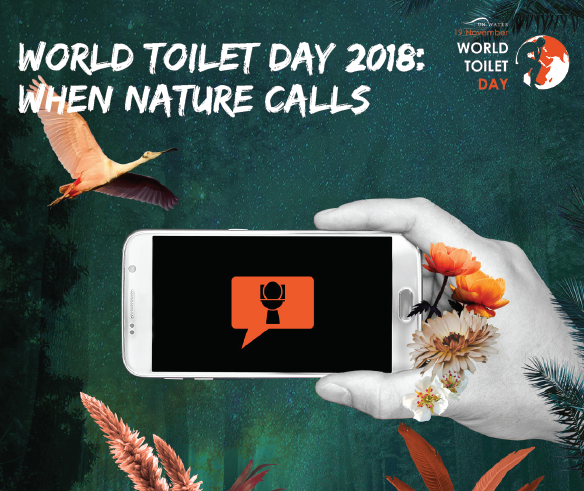 World Toilet Day, celebrated on 19th November, is about taking action to ensure that everyone has a safe toilet by 2030. The world is not on track to reach Sustainable Development Goal number 6: to ensure availability and sustainable management of sanitation and water for all by 2030. Today, 4.5 billion live without a safe toilet and 892 million people still practise open defecation. To improve this situation, IHE Delft is working on new technologies in faecal sludge management, and keeps working closely together with partners around the world to expand its sanitation education. On 19 November 2018, The new Faecal Sludge Laboratory in Delft was opened, which is the first of its kind outside Sub-Saharan Africa and South Asia. IHE Delft is proud to celebrate this event with friends and partners from the water and sanitation sector. In this facility WASH professionals from all over the world will analyse, research and learn about the characteristics, use and re-use of human excreta, for the benefit of improving health and quality of life. On World Toilet Day, University delegates from 13 countries will gather at IHE Delft for a proposal preparation workshop on the transfer of the Sanitation MSc programme to other universities. The workshop will last for three days. More information on the Global Sanitation Graduate School can be found here. IHE Delft has developed the emergency Sanitation Operation System (eSOS) toilet, which is a sustainable, holistic and affordable sanitation solution to be utilized during the aftermath of a disaster. The eSOS reinvents (emergency) toilet and treatment facilities, and uses ICT to bring cost savings to the entire sanitation management chain. These toilets are easily deployable in disaster areas because of their robust and light-weight specifications. Some unique features include remote-sensing monitoring, an energy supply unit, a GSM/ GPS sensor/card, occupancy sensors, a urine/faeces accumulation sensor, an S.O.S. button and a communication system transmitting data to an emergency coordination centre. The goal of the eSOS is to improve the quality of life of those in need during emergency situations and to minimize the threat to the public health of the most vulnerable members of society. The second prototype is displayed in the IHE Delft garden and will be tested in Nairobi, Kenya. In 2015 the eSOS toilet field was successfully tested in the Philippines. Today, on the occasion of World Toilet Day, IHE Delft and the International Water Association (IWA) signed a Memorandum of Understanding. At a global level, IHE Delft and IWA share a common objective to support the achievement of the Sustainable Development Goals by 2030, and the need to strengthen professional capacity in the sector to achieve global sustainable development. IHE Delft and IWA also recognize the important catalytic value of promoting positive change in service provision through training, education, knowledge development and research with and through a range of audiences in low and middle income countries. In realizing these objectives, both parties have identified three existing themes of collaboration through which activities are and can continue to be organized: Membership, Research/professional groups & knowledge production and Communication & dissemination. The purpose of this MoU (period of 5 years) is to establish collaborative arrangements between IHE Delft and IWA to achieve these common objectives. Through this MoU, and in keeping with an annual workplan, the Parties will develop a range of activities that leverage each other’s comparative advantages to support the achievement of the SDG targets goal 6. Our MSc programme in Urban Water and Sanitation educates professionals in the fields of water supply, sanitation and integrated urban engineering, particularly in urban areas. Click here for more information. The Graduate Professional Diploma Programme (GPDP) disseminates sanitation and sanitary engineering knowledge to professionals, and consists of a sequence of four or five online courses, regular short courses or a combination. The online courses can be followed part-time, without interrupting a daytime career. In order to ensure that the program fits the personal circumstances of the applicant, courses will be selected and a personal study plan designed in collaboration with a study advisor. The total duration of the programme is between 1.5 and 4.5 years. In partnership with the Bill & Melinda Gates Foundation (BMGF), IHE Delft has launched a new Master of Science Programme in Sanitation, developed and provided by the world’s top experts from both academia and practice.